Home / Blog » Does the Type of Fat in Your Diet Matter? They are polyunsaturated fatty acids (PUFAs) and are different from each other in their chemical structure. Linoleic acid (LA) is an Omega-6 FA and Alpha-Linoleic acid (ALA) is an Omega-3 FA. These fatty acids are metabolized into different longer chain fatty acids that have very different effects on your body, specifically on fat storage, inflammation, and on factors that can create plaques within the arteries. This is going to get a little technical but once you understand the below info, it is easier to understand why you need to increase Omega-3 fatty acids in your diet and decrease the Omega-6 types! Where are these fatty acids found? Omega-6 Linoleic acid (LA) is abundant in nature and found in seeds of most plants. LA is metabolized into ARA, which is found in dairy, meat from grain-fed animals and eggs. Omega-3 Alpha-Linoleic Acid (ALA) is found in green leafy vegetables, flax seeds, rapeseed, chia and walnuts. ALA is metabolized into EPA and DHA, which is found in fish and fish oil. All meats and even plants have both kinds of fatty acids present, but as modern agriculture has changed animal feeds, the fats in the meat, dairy and eggs and even farm-raised fish, have also changed. There is a difference in Omega-6/Omega-3 content in farm-raised and farm-grown produce compared to wild or free-range sources of food. Wild sources have a more favorable ratio! 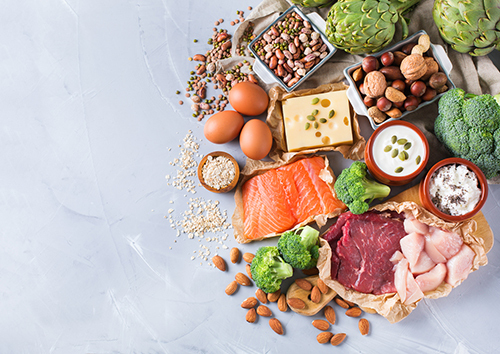 The amount of Omega-6 FA compared to Omega-3 FA in our diet has an effect not only on the amount of fat we store, but also on the amount of inflammation in our bodies and our risk for conditions like diabetes, metabolic syndrome, heart disease and cancer. Humans evolved on a diet that was balanced in the ratios of fatty acids and as the food supply has evolved, we have too much Omega-6 FA in our diet compared to Omega-3 FA, sometimes as high as 20:1. Lower amounts of Omega-6 FA in your diet by switching out oils high in Omega-6: corn oil, sunflower, soybean oil. Consider a fish oil Omega-3 supplement if your diet is not supplying a favorable ratio of Omega 3 to Omega 6. Alvheim. (2014). Dietary linoleic acid elevates the endocannabinoids 2-AG and anandamide and promotes weight gain in mice fed a low fat diet. Lipids. Saini. (2018, June 15). Omega-3 and omega-6 polyunsaturated fatty acids: Dietary sources, metabolism, and significance - A review. Life Sciences, 203, 255-267. Simopoulos. (2016, March). An Increase in the Omega-6/Omega-3 Fatty Acid Ratio Increases the Risk for Obesity. 8(3), 128. Wang. (2015). A prospective study of erythrocyte polyunsaturated fatty acid, weight gain, and risk of becoming overweight or obese in middle‑aged and older women. Eur. J. Nutrition.